Sewn With Grace: Thank You, Lori Holt! Tomorrow the new cafe is open for a sneak peek. I finished the window display yesterday. In the afternoon I picked up the quilt I made for the cafe. The pattern is called "Cakewalk" by Lori Holt. I nearly burst into tears when I saw the wonderful quilting my quilter/friend, Mary, did on it. The pictures absolutely do not give this quilt justice. It has been dark and grey in Kalamazoo and the pictures reflect it. 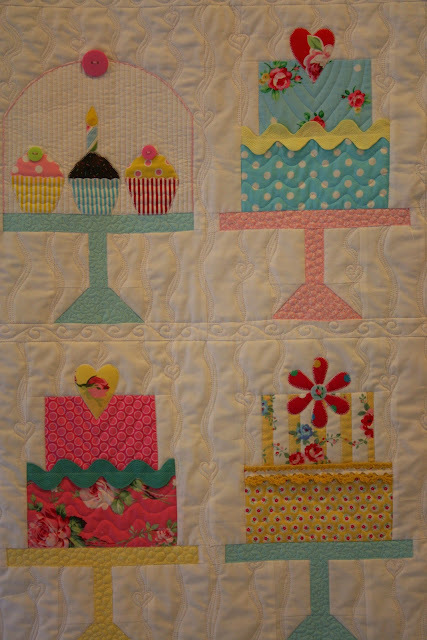 Because Nancy specializes in cupcakes, I put three blocks in with cupcakes on cakestands. I then embroidered a dome around them and put a button on for a handle. I love how it turned out. This quilt ranks number one in fun for me. I loved every minute of this process. From the "baking" to picking out the right cakestand to decorating the cupcakes. I think another one of these quilts may be in my future. Thank you Lori! You made my quilting, creative day! I'll be back with more pictures over the next few days. Don't forget that Monday is the day of my monthly giveaway! the quilt turned out beautifully. the new restaurant looks lovely, i wish kalamazoo wasn't so far away. best of luck in your newest venture, renee. Your quilt is absolutely beautiful!!! So yummy to look at. The new restaurant looks so darling and inviting. Great job! WOW the quilt is amazing!!! Love it and you did a wonderful job. I admire gals who sew/quilt! I think the cupcake design is perfect and now I want a real cupcake! LOL! Can't wait to come visit. Wow, the quilt is beautiful! I love all your fabric choices. Great job Renee! The window display looks great. Your quilt is wonderful Renee and looks perfect for a cupcake shop. The window is so pretty. I love it! My daughter will be baking cupcakes for our local Farmer's Market this year. She just made herself a cupcake apron. This quilt would be lovely if there was a place for it in the vendor booth! Thanks for sharing it. Oh my goodness...how adorable...joy x100 my friend.xoxo Love that quilt. Hugs to you. Oh my! The quilt is truly wonderful! And it looks delicious too! Ohhhhh Myyyyyy Goodnesssss!!!!!! Wow- So So Adorable! I love your version the cupcakes on it are darling! Really makes the quilt extra special. You finished it...and did a great job!!! I love that quilt! 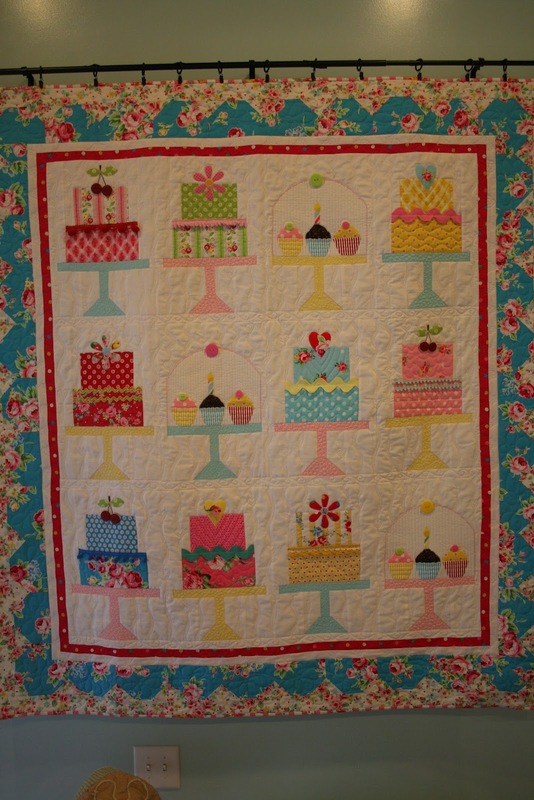 I decorate cakes and quilt, so this would be perfect for my kitchen! I just did a search for the pattern, did you make the pattern for the cupcakes? Would you be willing to share that part? I am definetely going to buy the cakewalk pattern! The quilt is just extraordinary! It will be perfect in the shop! I have the same comment as Missy Shay. I'd love to know how you did the cupcake pattern. I'd be VERY interested in making a quilt like yours. Just darling! love love love it! Lori has the cutest patterns, doesn't she??! Another of your many talents comes to light! 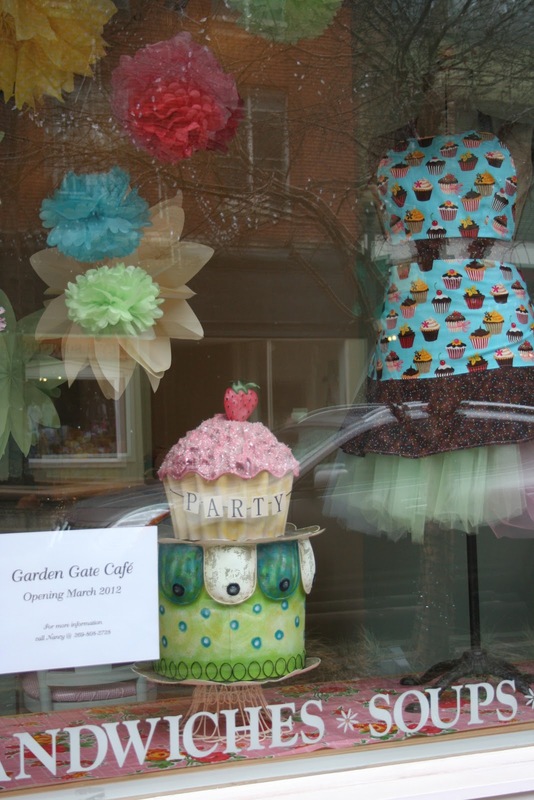 Your window display is lovely and the quilt is awesome! This looks like a really fun place to have a cuppa and a sweet. I love the quilt. 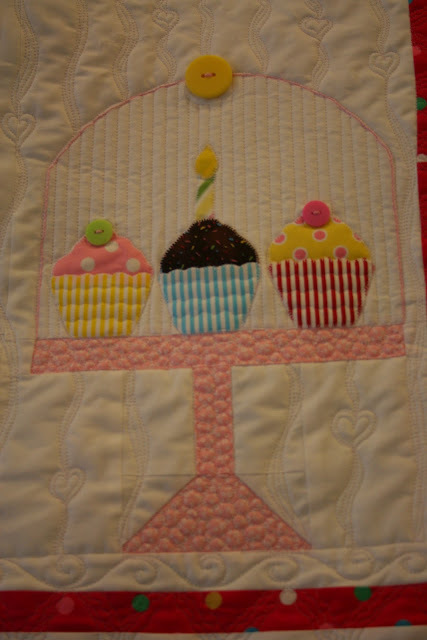 The fabrics are so yummy and the quilting amazing. Thanks for sharing. I wanted to find out if you used a layer cake of Flower Sugar or fat quarters. I've found a fat quarter bundle at Sew Fabulous quilt shop and just wondered if I needed this much. Maybe a smaller layer cake selection would do. Thanks for the time. MENINA!!! O que é isso??? ?Eu sou uma artesã,um pouco de tudo e de tudo muito.Ou seja:Quando cismo de fazer,aprender,dominar,modificar eu exagero(300 placas de dresden)dá para entender?O que eu vou fazer com tantas?Mais de 23.000 hexágonos de todos os tamanhos e cores e indo...Só trabalho com sucatas.Agora é decisão:vou fazer (eu me conheço)colchas,caminho de mesa ,almofadas,panô,bandô,tapete e ate pano de prato...Libera o passo a passo pelo amor de DEUS.Eu estou louca com este seu trabalho talentoso.PARABÉNS é muito pouco,vou mudar:DEUS TE ABENÇOE.Beijos.Maria do Carmo Pezzuto.ps:Sou Brasileira e não desisto nunca. Absolutely darling! I love everything you make and show. Your quilt is wonderful. 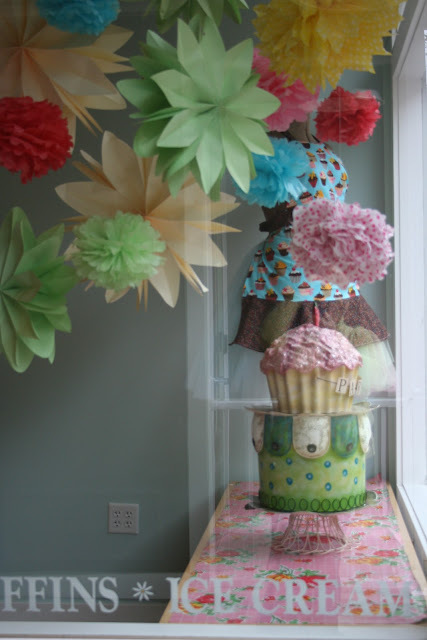 It is so perfect for the Cafe and along with it, your window display will entice many to come in. Read on Facebook, you weren't feeling well. Hope you are better now and were able to attend the opening. it is just wonderful....It is making me think of cupcakes..thats how good it is! Your quilt is beautiful!! I love the pattern, so fun!!! The storefront is adorable! I didn't realize you were in Kalamazoo....we're practically neighbors!